SPACE MOVEMENT - WHICH SIDE ARE YOU ON? The photo is from the Oceana Air Show Sept. 20 in Norfolk, Virginia. Demonstrators arrested: Susan Crane (Jonah House - Baltimore, MD, ), Steve Baggarly and Kristin Sadler (Norfolk Catholic Worker, Norfolk, VA) and Beth Brockman (Durham, NC). 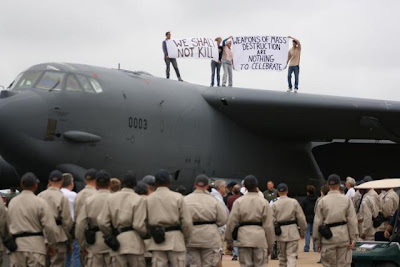 Four people got atop the B-52 on display. They were detained as were 8 observers. Eleven people received letters banning them from all Naval installations from Virginia to Maine. Steve Baggarly violated a previously received letter and will go to US District Court in Norfolk on November 3rd on a trespass charge which carries up to six months in jail and a $500 fine. Speak out now while you still can. We must rally the public before it is too late. Take bold steps each day. The wire is getting short. Don't be one of those who might say - I just wished I had acted when I still could.